This version of Emma weirdly came out in the same year as the Gwyneth Paltrow film. But other than being based on the same book, the two adaptations really have nothing in common. While the film version was all comedy and lightness, this TV version is really quite dark. I mean that both literally and figuratively. Maybe it’s because of the poor video quality, but the picture is usually quite dark. This makes sense, I suppose, to have realistic candle light at night-time scenes. But the scenes in the day-time aren’t that bright either. Andrew Davies, the screenwriter, chose to do something very different with this Emma. He focuses a lot on the class system, which was always there in the context of the book, but I thought it was a bit heavy-handed in this adaptation. All the underclass workers-servants, farmers, etc.- are clearly present in every scene, making the way of life for the privileged possible. They’re even moving pillows for them to kneel on in the strawberry picking scene. 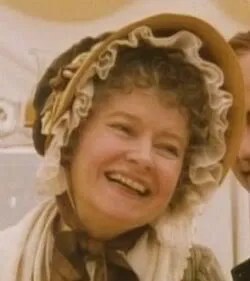 Emma makes sure to tell Harriet that Mr. Knightley owns EVERYTHING in Donwell, and all the other people who live there are merely his tenants or servants. Robert Martin seems very resentful of Emma, like he knows she advised Harriet to refuse him. He glares at her when she drops Harriet off at the farm. It’s a big deal at the end when Emma shakes hands with him. This class system was in the background in the book and I’m not fond of Davies’ idea to play it up (but I did think Emma and Robert Martin shaking hands was a nice touch). 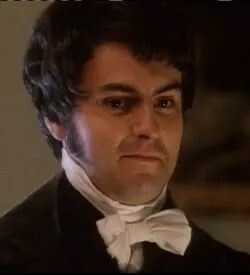 It’s just not what I want to see when I watch a Jane Austen adaptation. This is far from my favorite Emma adaptation. Aside from all the darkness, I wasn’t fond of most of the cast. It was also very short and while I know things need to be condensed, it felt very rushed and the Crown Ball scene was poorly done, IMO. 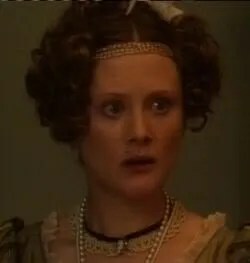 Harriet is dancing in the beginning, then Elton snubs her, then Mr. Knightley dances with her for less than a minute before walking away! Blink and you’ll miss it. 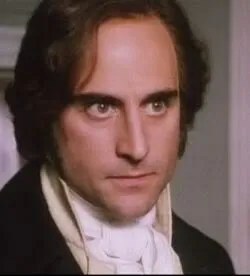 The ending scene was also rather weak- a harvest ball with Mr. Knightley making a speech to all his tenants (stressing again how many people depend on him) that he will still keep everything running smoothly even after he moves to Hartfield. Well, at least I can say that at least Andrew Davies didn’t add any sexed up scenes. 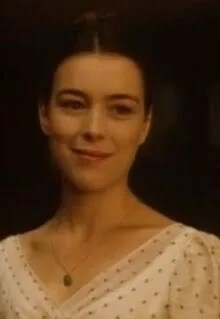 I thought it was nice to finally see a brunette Emma (especially since she resembles Jane Fairfax this way), but I’m not a fan of Kate Beckinsale’s portrayal. She looked the part, but she didn’t seem to connect with anyone else in the cast and she seemed bordering on being deliberately malicious in some of her manipulations. She emphasized the snob aspect in Emma’s personality more than anything else. She also constantly has daydreams and nightmares about the objects of her matchmaking which I wasn’t crazy about. I didn’t think they were all that funny and they felt out of place. I deliberately capped him with such a stern expression to emphasize how I felt about him the first time I saw this version. Well, he wasn’t the obvious romantic lead, that’s for certain. I found him way too harsh, especially at first. Over the years, I’ve grown less afraid of his portrayal but I still don’t like it. He didn’t seem like he really loved Emma at all. If someone told me he only married her to get Hartfield and her money I wouldn’t have a hard time believing it. I also found it really squicky that he keeps referring to holding Emma as a baby-VOMIT! He first mentions it when they are holding their niece, baby Emma. Then he just has to bring it up again right before they kiss. “To think, I held you in my arms when you were three weeks old.” Andrew Davies, what were you thinking? That’s not romantic, that’s disgusting! He wasn’t bad and he was handsome enough, but I didn’t think he was very memorable either. One scene I did feel was well-done was the disastrous carriage proposal. It really came out of nowhere and I liked Emma’s shocked reaction. I don’t know if it’s just me, but I thought she looked almost sickly in this. Was it the makeup? Was it the lighting? Was it my imagination? I thought she looked the right age for the part and would have been cute if she didn’t seem to be ill. Also, maybe it was because of the short time, but her attachments to men were downplayed. She got over Elton really quickly and then ended up becoming engaged to Robert Martin before she even knew that Emma and Knightley got together. She tried to do a Bristol accent, which I appreciated. Her attachment to Jane Fairfax and trying to find the latter a post as a government was really downplayed. He definitely looked the part, unlike Ewan McGregor, with his perfect curls. His portrayal really stressed Frank’s evil side. He was really creepy in the last scene telling Emma about Jane and her beautiful skin and how good she would look in his aunt’s jewels…can you say psychopath? She was undoubtedly my favorite thing about this version. 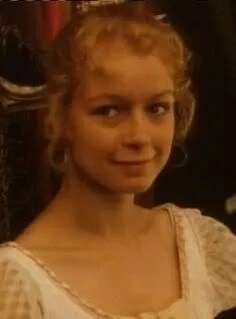 She’s the top actress to have played Jane Fairfax for me. She was always dressed a bit on the plain side, yet had an inherent elegance and beauty. She was definitely reserved and you could tell something was troubling her. I feel bad that she had to end up with that creepster, Frank. One of the other pluses for me. She was on the older side, but I’ve actually liked all the actresses to play Miss Bates in some way. I usually like Samantha Bond, but I didn’t feel the close bond between her and Emma in this one. (no pun intended…) I don’t know if this was the fault of the acting (and if so, on whose part? Hers or Beckinsale’s? Both?) or the directing or what. She seemed more like just a casual friend than anything. Bernard Hepton was pretty funny as Mr. Woodhouse and Mr. Weston wasn’t bad either. 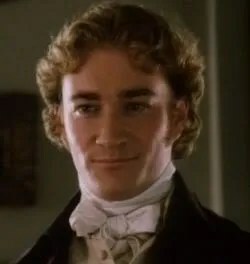 I also quite liked the portrayal of John Knightley. He seemed to be a fun, loving father, but could get quite frustrated in some situations like when Mr. Woodhouse would give his lectures. If I haven’t made it obvious above, I’m not very fond of this version of Emma. I do like it better than the 1972 miniseries, but really, that’s not saying much. It does have its fans though, and I can understand their point of view, even if I don’t share it. If you hate the Gwyneth Paltrow version, in particular, you’ll probably love this one. I’d really liked to know how you like the adaption from 2009? Have you seen it already? If not, you might not regret taking a look. It took me a couple episodes to get into the 2009 version at first, but I love it now!